We believe in the Holy Spirit – who is fully God and, while not to be confused with the Father and Son, remains one with the Father and the Son in being, majesty, and glory. The Holy Spirit convinces of the need of a saving relationship with God and engages every person who trusts and follows Jesus in a life- giving relationship. 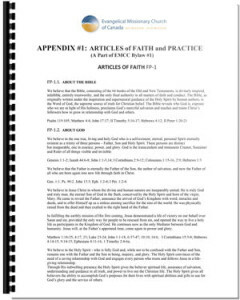 The Christian ordinances are two in number, baptism and the Lord’s Supper. They are the outward rites appointed by Christ to be administered in each local church, not as means of salvation, but as visible signs and seals of its reality. Baptism by water is the symbol of one’s union by faith with Christ in death, burial, and resurrection. It constitutes the public confession of these spiritual realities to the world and is the answer of a good conscience toward God1. Baptism is administered, preferably by immersion, to those who have been born again by faith in the Lord Jesus Christ and who give evidence of the genuineness of their salvation2. The Lord’s Day1, which commemorates the resurrection, is for private and public worship and for rest from unnecessary work. It should be devoted to spiritual development, Christian fellowship, and service2. It is essential to the permanence and growth of the Christian church and important to the welfare of society. In recognition of God’s ownership of all1 things believers should practice systematic and proportionate giving, adopting the tithe as a minimum expression of their stewardship2. They should regard Christian liberality as a privilege and sacred duty, and freely give of their substance for the spread of the Gospel at home and abroad, for the maintenance of the local church, and for the support of the agencies and enterprises of the denomination. We also believe the family of faith is where the goodness of being either single or married is to be honoured. We recognize that God has created human beings for relationship with him and with each other. God’s intention is for people to be blessed through families: both the family of faith and the family into which God has placed us. God created the family to be the cornerstone of social order. The home is a divinely established institution1 in which the husband is the head2 but serves its members by the law of love, and in which husband and wife are to work together to raise their children in the “nurture and admonition of the Lord.”3 Obedience to parents is to be rendered by children in the spirit of mutual respect and love. Marriage is part of God’s design in establishing the family. We believe that marriage is a lifelong covenant between one man and one woman. This heterosexual union4 is the only appropriate relationship within which the joy of sexual intimacy is to be expressed. We affirm such marriage as God’s design for a lifelong loving relationship, sexual intimacy, and the birth and nurture of children. Christian marriage is intended for those who share a common faith in Christ5. Such a marriage is blessed of God. Since the EMCC believes the Bible defines marriage as being a covenant union of one man and one woman, the EMCC only recognizes covenantal heterosexual unions as marriages. Therefore, ministers are forbidden to perform ceremonies or make any public comment that would give any indication to the contrary. FP-2.7.1. Divorce is viewed in the Scriptures as contrary to God’s will1. Christians should seek by forbearance and forgiveness to preserve the marriage bond. FP-2.7.2. Persons divorced and remarried who give evidence of being genuinely born again are eligible to be received into membership in the church. FP-2.7.3. Divorce between members of the church is an occasion of great tragedy. Such conduct brings the teaching and reality of Christian reconciliation under reproach and offenders are to be disciplined. The church board shall provide counsel and take proper disciplinary action giving consideration to appropriate aspects of local church discipline. FP-2.7.4. Ministers are to refrain from performing marriage ceremonies where one or both parties are divorced. However ministers are permitted, at their discretion, to solemnize the marriage of a person whose previous marriage partner committed adultery, who is recognized as living a genuine Christian life, and where there is good evidence that a true Christian marriage is intended. their bodies be treated as temples of the Holy Spirit (5) thus making it inconsistent with both Christian testimony and sound principles of health to compromise their influence and injure their bodies through inappropriate practices or substance abuse (6). Civil government is ordained of God (1) for the welfare of society to promote and protect the good and to restrain and punish evil (2). Therefore, we consider it the duty of Christians to pray for rulers and for those who are in authority over them and to give due loyalty, respect, and obedience to them (3). Christians are also encouraged to take an active interest in government at all levels. Where the demands of civil law would militate against the supreme law and will of God, Christians should obey God rather than man (4). FP-2.10.1. Believers are to love their enemies, do good to them that hate them1, overcome evil with good, and, as much as possible, live peaceably with all men2. Therefore, it is not fitting for the Christian to promote strife between nations, classes, groups, or individuals. FP-2.10.2. Sincere Christians have conscientious differences as to their understanding of the teaching of the Word of God with reference to their responsibility as Christian citizens to human government both in times of war and times of peace. We are, therefore, to exercise tolerance and understanding, and respect the individual conscience with regard to participation in war. A Christian’s life should be so transparent in its honesty and integrity that his or her word can be fully trusted without swearing on the Bible in judicial situations (1) or taking the Lord’s name in vain (2).